A gift should astonish, thrill and surprise the receiver, creating above all a feeling of empathy with the giver. Whatever the occasion, we can help you choose the perfect gift. And the presentation is no less important. birthdays, name days, births and christenings, communions and confirmations, weddings, anniversaries, etc. The package can be adorned with themed floral decorations and handmade ornaments (even made exclusively just for you). Christening gift for a baby girl. The basket in the photo contained not only floral decorations but also a place setting for one person (a dinner plate, soup dish, dessert plate, cup and saucer) in hand-painted china in the Louis XV style and with personalised gold initials; a set of silver cutlery for a child (fork, spoon and knife) with engraved initials; an egg-cup and spoon in silver (personalised with the name and initials respectively); a linen napkin with a silver napkin ring in the form of a tiara, with the name engraved on it. 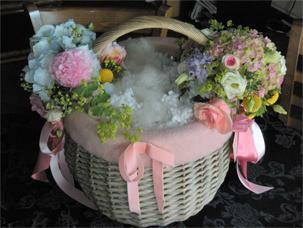 All the items were wrapped in white boiled wool with pink satin ribbons, and the basket was filled with wadding to create the appearance of a nest. 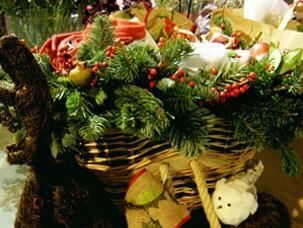 The photo shows a handmade pannier from the Val d’Aosta region, decorated with a little wicker reindeer and a bird. The edge of the pannier is decorated with a Christmas garland of fir, red hawthorn berries, cinnamon sticks and small apples. Inside there was an Agnona red cashmere throw, a set of two linen place mats embroidered with Christmas motifs, tea towels embroidered with Christmas motifs, homemade cinnamon and sultana biscuits, pomegranates, oranges, tangerines, apples, nuts and hazelnuts. The ribbons came from France and Belgium. 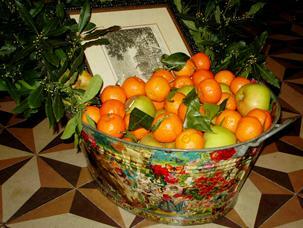 An old zinc basin, decorated using the decoupage technique with scraps of antique paper, was filled with oranges, clementines, tangerines and apples (fruits that were once given to children at Christmas). Two original 18th century French engravings of castles were added, and then the composition was completed with big branches of mistletoe. Gift for Saint Valentine's Day. 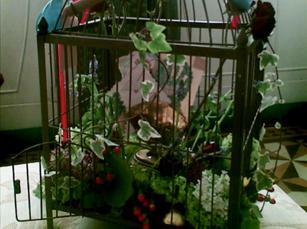 We took a period birdcage in iron, and created a small miniature garden inside, using plants that recall the idea of a loving bond – ivy, red roses and forget-me-nots. In the middle, an English brass card-holder from the 19th century in the form of a music stand (the receiver was a musician), accompanied by three French postcards from the early 20th century echoing the theme of love.